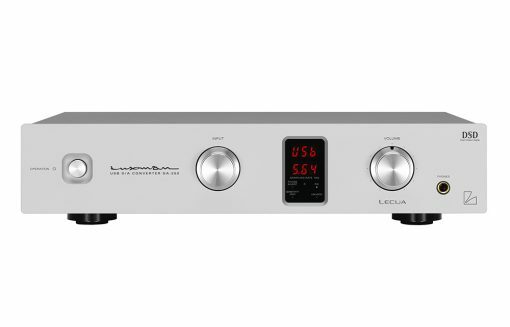 Luxman DA-250 is a Class A Preamplifer, Class A Headphone Amplifier and a USB capable Digital Audio Converter packaged in a slim & compact B4 form factor. 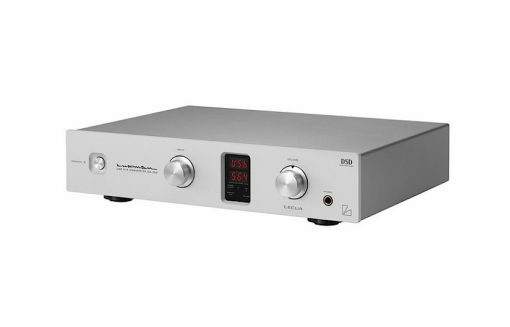 Luxman’s DA-250 is a Class A Preamplifer, Class A Headphone Amplifier and a USB capable Digital Audio Converter packaged in a slim & compact B4 form factor. It delivers a wonderfully musical rich tone that will provide countless hours of fatigue-free listening enjoyment. The DA-250 is the successor to the DA-200 which launched in 2010 and proved tremendously popular among desktop audio users. 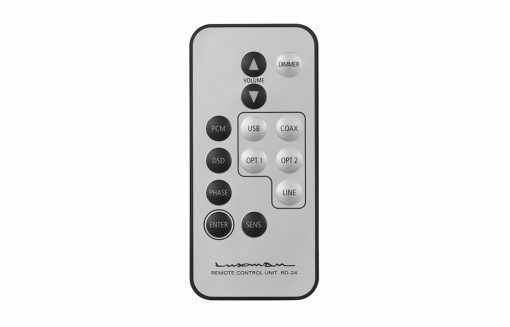 Luxman’s sales team and engineers have continuously listened to end users’ comments carefully and exchanged opinions about applications and styles on how best to enjoy computer audio. 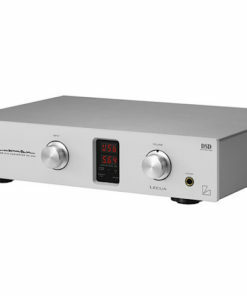 Now Luxman is introducing this new USB D/A Converter DA-250 which is much improved over the DA-200 by focusing on upgrading its sound quality and adding new features and incorporating the latest technology. Output signal can be selected between Fixed and Variable modes. 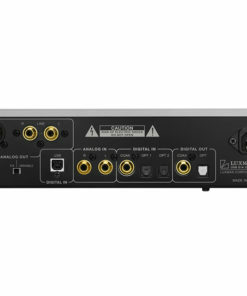 Variable position is convenient for a direct connection to a separate type power amplifier or a powered speaker system. 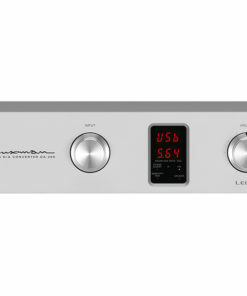 For example a matching LUXMAN M-200 stereo amplifier can be used to drive the loudspeakers of your preference. Luxman’s proprietary design, electronic attenuator “LECUA*” first introduced in the flag-ship C-1000f control amplifier is now employed in the DA-250 for both headphone and line outputs independently, operates fully in the analog domain, it eliminates all potentiometers from the signal path. This has a number of advantages, such as (1) outstanding S/N ratio, (2) extremely low distortion, (3) virtually no change in frequency response and sound quality at any listening level, (4) minimal left/right level differences (tracking errors), and (5) minimal left/right cross-talk. The result is a volume control that far surpasses conventional concepts. By adding a new discrete buffer circuit to the headphone output, the drive impetus has been greatly improved. 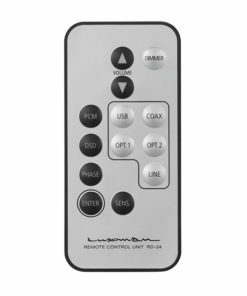 The input sensitivity can now be selected from the remote control. By providing an independent buffer circuit to each output (balance/unbalanced/headphone), the interference and changes in sound quality when used simultaneously have been eliminated. 18mm pitch gold-plated RCA jacks and Neutrik XLR connectors are provided for use with high-performance signal cables. The seven-segment LED display of the two-stage × 3 Digits with dimmer function which display various modes. All outputs can be phase inverted. 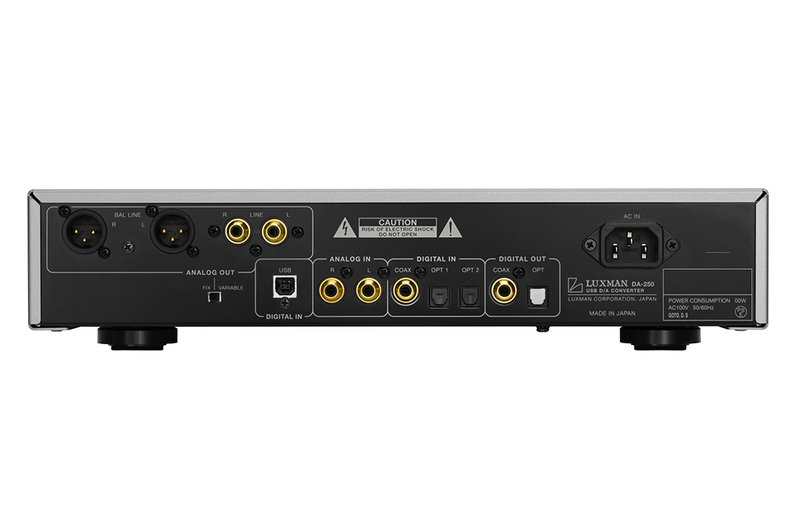 Thus, connections with audio equipment with balanced inputs and source’s phase-inverted playback are possible. 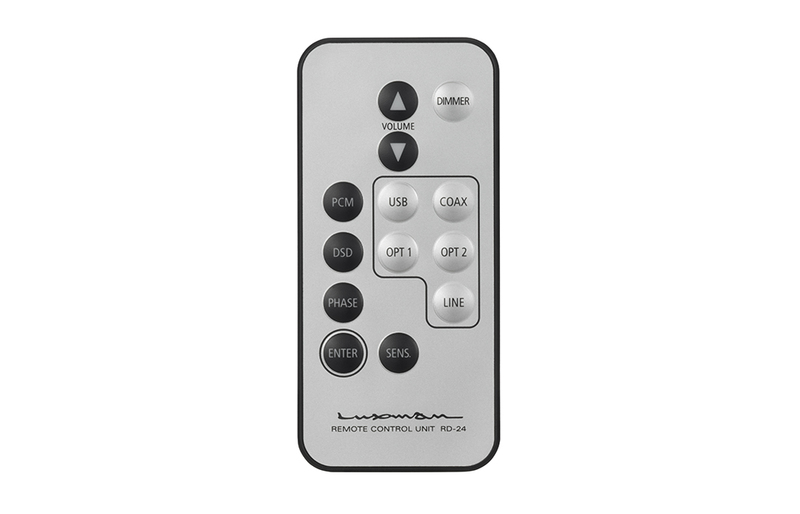 A credit-card type compact remote control comes with volume and input controls. The original high-quality sound music playback software “LUXMAN Audio Player” that can be used with FLAC / ALAC / WAV / AIFF is also available.